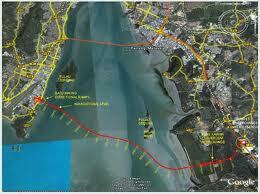 rocky's bru: Consultant to LGE: Stop blame game, expand your tunnel vision! Consultant to LGE: Stop blame game, expand your tunnel vision! Readers of both my blog and Khoo Kay Peng's Straight Talk would remember us having agreed to disagree. His latest posting CM Lim Guan Eng should seek a clearer view on his tunnel vision, however, is something I'd disagree to agree. If traffic congestion is really what LGE wanted to solve, he should be focusing on moving people rather than vehicles, he should start talking to the bus operators, and, most importantly, he must stop politicizing the issue. "... I know his motive is to extract the maximum anger of the people against the federal government. But we must call a spade a spade and be fair to the Rapid Penang team led by Jamali Soaidin, the COO. Jamali is an Ampang boy who is a trained infrastructure engineer. " If you wish to leave comments for Mr Khoo, clck h e r e.
it should be adequate to accommodate the volume for many years to come."